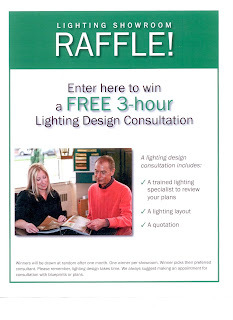 Enlightening (Residential Lighting Blog): Free Lighting Layout! A trained lighting specialist to review your plans (you can choose your specialist from any of our 3 area showrooms ~ Arlington, Laurel, or Chantilly). Winners will be drawn at random at the end of February. One winner per showroom! So normally we would charge $100 per hour, and then we apply that fee in full to your order, as long as the majority of the original quotation is ordered. So really, it's free to you. Please remember that lighting design takes time, and we suggest making an appointment for consultation with blueprints or plans.